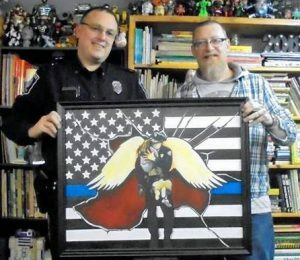 Local artist Brent Batchelder of Club Neopolsi Creations has created 11x30-inch painting to be raffled off at the Maine Association of Police (MAP) awards banquet in Portland on Jan. 26. Rumford Police Sgt. Tracey Higley (left) poses with local artist Brent Batchelder of Club Neopolsi Creations with this 11×30-inch painting to be raffled off at the Maine Association of Police (MAP) awards banquet in Portland on Jan. 26. RUMFORD — In cooperation with the Rumford Police Department, local artist Brent Batchelder of Club Neopolsi Creations has created 11×30-inch painting to be raffled off at the Maine Association of Police (MAP) awards banquet in Portland on Jan. 26. Rumford Police Sgt. Tracey Higley said Batchelder donated his time, effort and some of the materials. The officers who make up the Rumford Police Association (RPA) also helped pay for some of the materials, and then they are donating the painting to MAP. Higley said proceeds will go to the MAP charities account, which goes to a number of charities all over the state either by request or to what is deemed in need. These include towards someone whose lost their home to fire, or to a scholarship. RPA, which uses officer donations, also donates locally, to things like the school’s Renaissance Program and the Zombie Run.